Nansen Lai, the proprietor of the refined Cantonese establishment Flower Drum in Wan Chai, has set eyes on Sichuan, exploring the possibilities of Chengdu-style cuisine, noted for its vibrancy of spices but not overpoweringly fiery dishes. Jing Alley’s understated entrance welcomes guests with a brick-lined walls, leading everyone into a rather dim and petite ground floor space with booth seating on both sides and small four-tops set in the middle. The lighting was dimmer than most Chinese restaurants, and the monotonous grey brick-finish of the interiors seemed rather unflattering to the overall ambience. A light playlist of jazz, however, helped set the overall mood of the dining experience. Jing Alley’s Sichuan fare leans towards Chengdu-style rather than the more common Chongqing-style. The latter relies potent spices that often result in sending shockwaves of chilli heat to the palate with alternating sensations of tickling heat and numbing from Sichuan peppercorns. Chengdu-style fare, however, is more about flavours working in harmony. Dishes can be hot with chillies but less on dominating in intensity, but rather polished and more subtle. We begin with chicken with homemade Sichuan pepper paste. A cold shredded chicken starter where the bird was deboned, shredded, and piled up with a green zigzagging of dressing. The Sichuan pepper paste was surprisingly mild, but the aroma of toasted Sichuan peppercorn was the key ingredient, as the bird itself was rather bland without the dressing. Steamed Qingcheng assorted cured meats in lotus leaf is an acquired taste. Slices of Sichuan sausages, cured ribs and pork belly are semi-dried with a five-spice and salt cure. The sausages were outstandingly rich and unctuous, unlike the ribs which are rather lean and tough. Chengdu-style boiled jaguar guapote arrived in a wide but shallow bowl. The jaguar guapote is a freshwater fish which flourishes in Central America. Often adopted for displays in aquariums, their flesh is surprisingly meaty and firm. 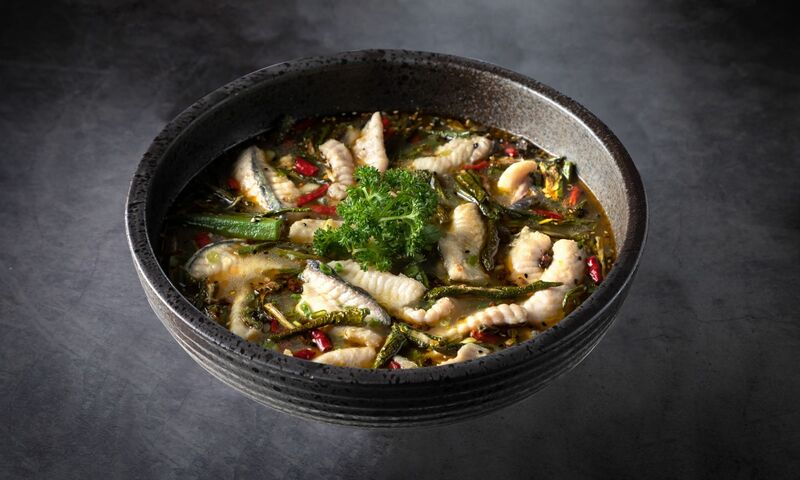 Jing Alley’s signature dish features this unique fish, deboned and sliced thickly, simmered briefly in a pork-bone-based broth before adding a final dash of spicy oil enriched with green chillies and fresh and dried green Sichuan peppercorns, yielding a tint of dark green in the broth. The aroma was alluring and the fish slices had a bite to them. Cucumber batons and mung bean sprouts were tender, while sweet potato noodles were thin and gelatinous, absorbing the broth that was rich in flavour with mild heat that grew in intensity at the back of the palate. Braised duck maroon jelly with pickled mustard greens, chillies and minced pork was a surprise. Jellied duck blood was cubed and braised lightly in a thick meat sauce enriched with homemade pickled mustard greens, leafy and finely julienned, weaving through the hearty sauce that went great with bamboo-steamed glutinous rice, as well as steamed rice. Mapo tofu in Sichuan style was properly prepared. Often seen laden with a layer of orange-hued chilli oil, Jing Alley’s version was more polished, releasing a toasty aroma of Sichuan peppercorn as it arrived. Tender cubes of silk tofu tossed in a savoury meat gravy induced a greater numbing sensation than exciting heat. We ordered jelly fig seeds with peanut and pine nuts for desserts. The softly-set jelly was thoroughly chilled and loose in texture, but the highlight was the Sichuan red sugar syrup, an earthy molasses that leaves little aftertaste. There are other varieties available served with mango, mixed fresh fruits or even manuka honey or osmanthus and birds nest. Jing Alley’s wine list showcases a collection of predominantly Bordeaux wines, with labels neatly showcased by the bottle only and categorised by region. It is a shame the restaurant lacks a wine-by-the-glass option, but guests are welcomed to enjoy Spanish beers which are well-chilled and a quench for thirst and relief from the heat of the chillies’ heat. Service at Jing Alley is mostly attentive, as members of the service team are keen to refill hot teas for guests, although changing plates can be random, often occurring while guests are enjoying a dish rather than in between courses. The staff show initiative in describing the menu’s food options but were rather weak on wine pairing and portioning suggestions. Jing Alley shows excellence in its food offerings, subtly setting a balance in flavours and a fine distinction from conventional Sichuan restaurant offerings. We recommend dining with larger parties to share more of its signatures, as serving portions tend to be large enough for sharing. Each of our reviewers score restaurants based on four main criteria: setting, food, service, and drinks, taking into account more than 35 different points of reference including manners of staff, usefulness of the wine list, and whether or not the restaurant makes an effort to be environmentally aware. 5/5 indicates an exceptional experience; 4-4.5/5 is excellent; 3-3.5/5 is good to very good; and 2.5/5 or lower is average to below average. Before visiting a restaurant, the reviewers will book using a pseudonym and do not make themselves known to restaurant staff, in order to experience the venue as a regular guest—if this is not possible, or if we are recognised, we will indicate this in the review.